The Ford Bronco is a sport utility vehicle that was produced from 1966 to 1996, with five distinct generations. The original Bronco was an ORV (Off-Road Vehicle), intended to compete primarily with Jeep CJ models and the International Harvester Scout. The redesign of the second generation Bronco in 1978 was based on a shortened full sized F-100 pickup. It had a removable top and forward folding rear bench seat, similar to the competing Blazer. (1980 - 1986) The Ford Bronco received a major redesign for 1980, coinciding with the F-Series pick-up truck. The new Bronco was shorter, and had cosmetic changes along with powertrain, suspension and other odds and ends. 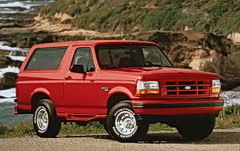 (1992 - 1996) The Ford Bronco, along with the F-Series truck, was updated for 1992. The new Bronco was redesigned with safety in mind, incorporating front crumple zones, rear shoulder seat belts, a third brakelight embedded in the removable top, and after 1994, driver-side airbags. i love my bronco it haves a 5" lift with 35" tires. i love the power it has a big block 400 which will easily roll those tires its great. I got a 90 Bronco with the 5.8 and i love it. It has lots of power, room just everything about it is asome. I do wish that they would of put a diesel in it but o well. I have over 200,000 thousand on mine and it starts every morrning and drives at least 100 miles a day.For the most part is kinda stock and have only had a few problems. This trucks are great. Typical Ford. Front end was completly shot after first trip offroading. Through a rod going 80 mph and engine lit on fire. I would have let it burn if I had better insurance. I Replaced 5.0 engine and the transmission started slipping three days later. In side of door rusted out and I inadvertently ripped the handle off (I JB welded it all together again). Steering was messed up after taking an ramp too fast. (I was too angry to even think about fixing it). Traded it in a year after purchasing it. I got $4500 for it from a Toyota dealership. Those fools were so stupid that they should be taken out back and shot. Gas Hog! Possessed by the devil. This thing was possessed by the devil himself. I had the bronco for a year and it never ran right. I would take it to the shop just to put it back within a day or two later. When we first got it we had a complete tune up and a new battery then it wouldnt run right had to take it back and have the catalytic convertor replaced. It worked for oh about one month and the starter went out. Had that fixed and the next day I was driving it and it shut off on me. So we had the alternator replaced. It ran okay for about a week and wouldnt start the one day. Well after that I got rid of it. I was spending $400 a month for the gas alone and have put at least $2500 into repairs within 6 months. It did have alot of rusting in tail gate area. Notthing a good body man couldn't fix. After all it is a 1989 model. i've had my bronco for about 7 month and hasn't broken down yet. i saw it in front of the dealler ship and fell in love instantly. it's been through mud, snow, ice and an occasional golf course sand trap. its my first bronco but defanatly not my last. its all i will ever drive. Wow this is a great rig I have looked and looked for one that did not have the crap kicked out of the body or the interior on the trails. I finally found one that was owned by an old man who took car of it and sold it cause it needed a new pan gasket. So far with a tune up and new shocks with BFG AT KO's nothing has been in its way off or on the street. Its goes through mudd no problem, ice and snow, the street it rides like a linclon. I'm throughly im pressed with the rig and will keep it till it dies and the give it a new motor. these rucks go over or through what ever you point it at. very comfortable ride even with out the armrest. i bought this truck to beat and leave in the woods after a romp. After driving it home, I did not have the heart to do it. It drove so nice. It was a PA truck and pretty rusted out. The driver rocker and floor came out about 700 miles in to the trucks new life. I replaced all of that and the truck was so soilid after that i was in love. I wish i had a nice bronco!! I travel alot so i keep her on a automatic battery charge and put sta-ble in the in a fulltank when i am gone. It starts every time. the steel wheels are good to go, never leak. gas. Paint chips on the hood. I love this beast. i have always wanted a Bronco and bought this 2 years ago. I is pretty much stock and it keeps up witht the best. It has 157,000 miles on it and is running strong. Great for off road use and as a daily driver. I wouldnt drive anything else. 5.8l V8 cant be beat.